La Maxima 79 and Jimmy Bosch played live @ Frankfurt Festival 2016. The concert won’t take place 2017. Fabrizio Zoro is one of the most popular djs and producers in Italy. He is resident dj in many salsa clubs in Milan and knows everything about salsa in Italy. Within the last decade he has dedicated himself completely to latin music. In 2013, he started his band project ‘La Maxima 79‘ together with Massimo Scalici. At the moment, the band receives more and more requests after their CD has been played on the dancefloors across Europe. Michael Beyer: Fabrizio, most people connect you to ‘La Maxima 79‘, but you work as a professional lyricist and songwriter too. Lyrics and arrangement of Johnny Vazquez‘s latest song ‘Azafata‘ were written by you, can you name some other songs you have worked on? Fabrizio Zoro: In addition to “Locura“ I have also done some other Bachatas, for example “Sin tu amor” and “Nena“ sung by Fernando Sosa. But above all there are other songs as “5 Minutos“ (Tony Velardi and Ivan Venot) and the new ones „Topanga“, „A Gozar“ and „Me La Das“ which you can find on the Salsa.it compilation vol. 10 . Even if I am not indicated as the singer I’m behind every arrangement or text. I’ve also done two Kizomba „Tell Me“ by Gloria Bianco Vega and “12 a Love“ by La Urbana 22. All have been edited by my Label SMAYRA PUBLISHING. But the latest news is: we have just started to produce a new song with Johnny Vasquez. It will follow the ‘Azafata‘-style but the title will be more suitable to the person of Johnny. Michael Beyer: How did the whole project of ‘La Maxima 79‘ start? 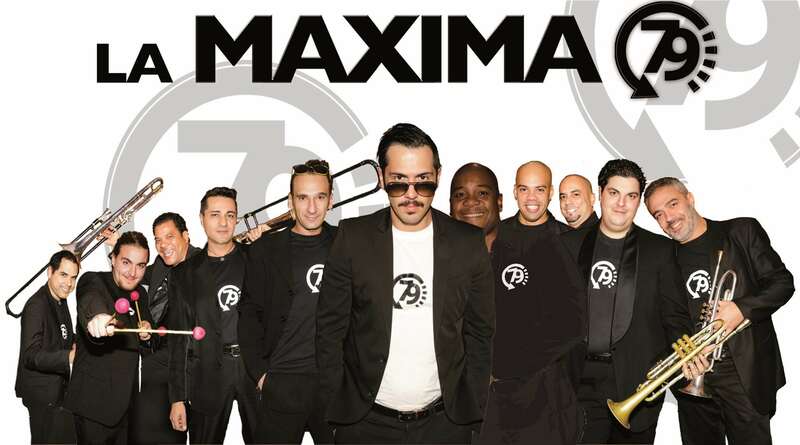 Fabrizio Zoro: The Maxima 79 project was completely an idea of mine. Listening to music every day I figured out that a recording with style and sound of the 70s, but done nowadays, was missing. Moreover I was tired of buying CDs of salsa classic style where out of ten songs only one was playable. Thus I started talking about this project to Massimo Scalici another great 360° Master and rarely anyone knows that he is also a great latin dancer. He agreed to follow my ideas and in 2010 we produced the first single ‘Mi Chula‘, in 2011 ‘Habia Cavour‘ in 2012 ‘No Sirvo Pa‘ Queso‘ and in 2013 the CD „Regresando al Guaguanco“ was published. Michael Beyer: Umberto Nocita (performing on stage with Roberta Annaloro) is playing the congas. You are a dancer yourself producing and editing music for some of the world‘s top artists like Juan Matos, Adolfo Indacochea, Flamboyan Dancers, Tropical Gem, etc. Do the dancers in the band have a direct influence on the arrangements of ‘La Maxima 79‘? Fabrizio Zoro: Yes, Umberto is a great dancer who danced also in Francisco Vazques‘ company but for me he remains one of the greatest conga players I have ever seen, a super sound and then he knows like me both music and dance and he knows what the public wants to listen to. Even if expert dancers have been all my friends for years doing music for their choreographies, they have not had any role in my ideas, but people who dance on dance floors did. Social dancers are fundamental parts of my ideas. Seeing them I got ideas for breaks, on the base of what they performed best. If I have to mention the name of a dancer who helped me thinking about different arrangements, there is one great Italian talent called Jonathan Somoza. I imagined the breaks and I imagined him dancing on it, as he is one of the best artists to interpret music. Juan Matos has been my inspiration for the text of ‘La Pachanga de Don Juan‘. Michael Beyer: Some DJs say that they recognize an Italian salsa production. Would you agree that Italian productions have certain distinguishing characteristics? Fabrizio Zoro: It’s true. In the world many people recognise the style of the salsa made in Italy because it’s always mixed with computerized elements. This has been the situation for 10 years, but nowadays I feel free to say that in Italy we are pioneers of a style, not only made by ‘La Maxima 79‘ but also by other orchestras that let their voice be heard because they play real “salsa”. Not only timba like ‘Pablo Timba y Su Timba Calle‘. Personally I’m producing one group called “Ire‘ Oyale Sextet“ who plays music in the style of “Grupo Latin Vibe“ or “New Swing Sextet“. There is another group called “Azucar“. I am sure that in 2 years people who also play music will see Italy in a different way. We have already begun this new path with “La Maxima 79“. Michael Beyer: The first CD ‘Regresando als Guaguanco‘ of “La Maxima 79“ went viral and is a tremendous success. Do you still have the time for djing and other projects? Fabrizio Zoro: This is an interesting question. Now, five months after we have published the recording the first live dates come out. I already must skip working in many clubs where I usually work. But I want to create a future in which all Europe can dance to my productions. For doing this I get up every day at 8 a.m. and I go to sleep at 4 a.m. I can tell you that it would be better if a day had 26 to 27 hours. I want to thank you Michael and all guys of the magazine for the opportunity you gave to me because in this way you can dedicate a little space also to music because as I always say “music makes dance and dancers and not vice versa. Michael Beyer: Thank you Fabrizio Zoro, we know you have to work every minute. The European salsa scene is looking forward to listening or dancing to your future projects.